The work, led by University of Iowa heart researcher Long-Sheng Song, MD, focuses on a protein called junctophilin-2 (JP2). Previous work from Song’s lab has shown that JP2 is a structural protein that is essential for heartbeat and that loss or disruption of JP2 is associated with heart failure. The new study conducted in mice and published online Nov. 8 by the journal Science, reveals that under stress conditions, JP2 is cleaved into two fragments. This breakdown of JP2 damages the structural architecture of the cells and disrupts heart cell function. The new study’s surprising finding is that one of the newly created fragments of JP2 protects the heart from damage by traveling to the heart cells’ nuclei and turning off the expression of genes that promote heart failure. A University of Iowa study finds that cardiac stress transforms an important structural protein into a gene regulator that protects against heart failure. 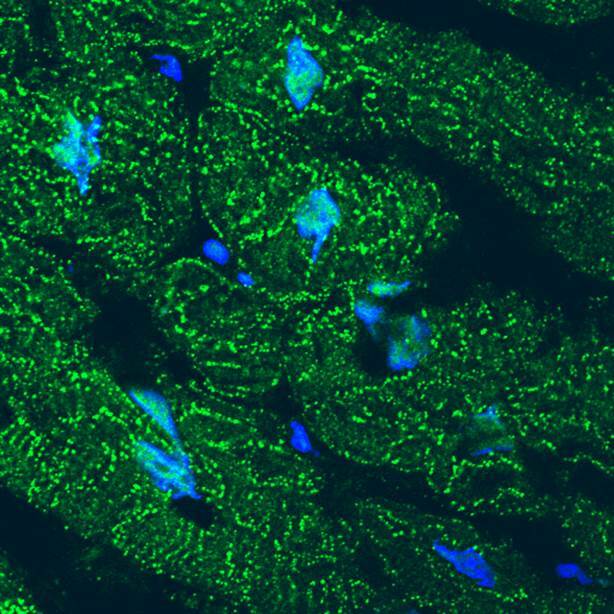 The image shows accumulation of the N-terminal fragment of the protein junctophilin-2 (JP2) in the nuclei of failing human heart muscle cells. Green shows the location of JP2 or its N-terminal fragment. Blue indicates the cell nuclei. Under stress conditions, JP2 is cleaved into two fragments. The cells’ membrane structure is severely damaged due to loss of the full length JP2. But the JP2 fragment migrates to the cell nuclei and turns off genes that promote heart failure. Image courtesy of Long-Sheng Song, University of Iowa. Heart disease conditions—like high blood pressure, blocked arteries, or heart attack—all put stress on the heart. At the cellular level, this type of stress activates an enzyme that cleaves JP2 into two fragments. The new study shows that the N-terminal JP2 fragment migrates to heart cell nuclei and initiates genetic changes that protect against heart failure. The DNA sequences that allow the fragment to travel to the nucleus and that regulate gene expression are highly conserved among many species from mice to humans. 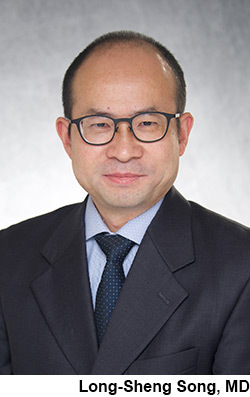 Song’s colleagues on the study included Ang Guo, PhD, UI research assistant professor in internal medicine, who was the first author of the study, and UI researchers Yihui Wang, Biyi Chen, Yunhao Wang, Jinxiang Yuan, Liyang Zhang, Duane Hall, Jennifer Wu, Yun Shi, Qi Zhu, Cheng Chen, William Thiel, Xin Zhan, Robert Weiss, Fenghuang Zhan, Catherine Musselman, Miles Pufall, Kin Fai Au, and Chad Grueter from the Abboud Cardiovascular Research Center, and the Departments of Internal Medicine and Biochemistry at the UI Carver College of Medicine. The research team also included Mark E. Anderson at Johns Hopkins School of Medicine; Jiang Hong at Shanghai Jiao Tong University School of Medicine; and Weizhong Zhu at Nantong University, China. This work was funded by grants from the National Institutes of Health, the Department of Veterans Affairs, and the American Heart Association.